Is it Gamecock or Tiger Time? With the 2nd week of Carolina and Clemson football, it was only fitting to showcase our collection of Carolina and Clemson watches! 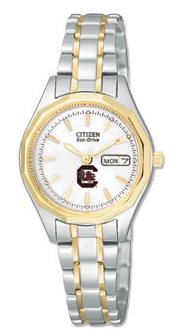 See our collection of Carolina watches here, and our Clemson watches here. Did you know that Jewelry Warehouse is the only exclusive retailer of Gamecock Citizen Watches? Also, don’t forget about the Championship Challenge! If you purchase either Carolina or Clemson items, from the 10 vendors we have to choose from, and either team wins the Championship, you get a full refund! Check out more information here. This entry was posted in Jewelry and tagged citizen, citizen watch, clemson, clemson watches, fossil, fossil watch, gamecocks, gamecocks watches, watch, watches. Bookmark the permalink.